Cruise to the 2,000-year-old city of Cologne, Germany, with its grand gothic architecture and lively shops, cafés, and taverns. Try a locally brewed Kölsch beer, and stroll the Christkindlesmarkt for mementos, confections, and hot drinks. You’ll then cruise through the dramatic Rhine Gorge—where ancient castles stand on cliffs 400 feet above the water—on your way to charming Rüdesheim where you’ll be enchanted by the festive Christmas market glow. Visit Siegfried’s Mechanical Musical Instrument Museum for extra holiday cheer. Continue your Rhine river cruise with a visit to Mainz, and visit the remarkable Gutenberg Museum, lovely holiday markets. Join an excursion to Heidelberg to for a castle visit to see the world’s largest barrel of wine! In Strasbourg, France, you’ll be amazed by the red-sandstone gothic cathedral with ancient murals and fascinating astronomical clock. The city’s Christmas market is one of the oldest and finest in Europe. You’ll sail to the gateway to the exquisite Black Forest in Breisach, Germany, as you experience the magical charm, festive lights, and festive décor of each destination’s shining Christmas markets. 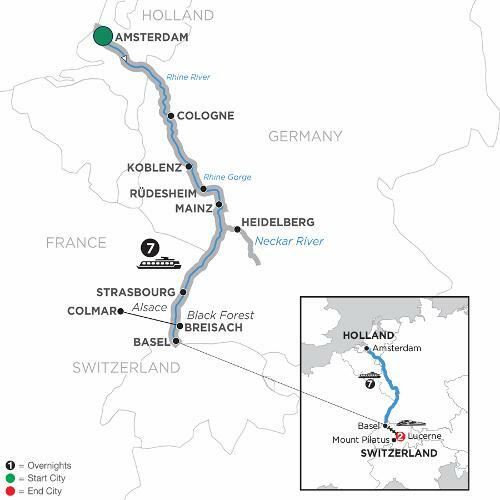 You’ll complete your cruise in Basel, Switzerland, and set out for your European vacation in Mt. Pilatus and Lucerne. Your Monograms Local Host® is on hand to assist you during your 2-night stay in Switzerland. Enjoy a guided walking tour including the Lion Monument, Old Town, Chapel Bridge, the Water Tower, Jesuit Church, and a special highlight excursion to Mount Pilatus.